Non-nominal systems: Pipe leak, Fans on backpack 2 & 6, roof heater, light bulb in the bathroom, hesitation about burnable/unburnable trashes. All engineering checks were nominals, but during the EVA fans of backpack 2 and 6 turned out of service and both helmets were very foggy. Backpacks 2 and 6 joined backpacks 3 and 4 to the list of backpacks the crew need to fix. The crew was supposed to fix them today but the we were all very busy. I hope we’ll begin tomorrow. At 5:00 PM, a crew member was unable to light on the bulb in the bathroom. It seems that it is broken. During the EVA engineering check, the EVA members had to but five wastes bags into the outside trashes but “Burnable” and “Unburnable” weren’t indicated. Therefore, they randomly put the wastes into the trashes, which is quite pity considering we do a selective sorting for wastes. Ethanol Free Gasoline (5 Gallon containers for ATV) – 7 gallons. Notes on ATVs: Because of the cold night, it took a few minutes to turn them on. Summary of internet: CapCom Bernard wanted some information about the Hab Router. I gave him it by email. Summary of suits and radios: Backpack 2 & 6 put aside. Summary of GreenHab operations: Jeremy (GreenHab officer) began to set the new shade with the help of other crew members. Is it possible to have a new light bulb for the bathroom ? Does a map of all Hab pipes exist ? I still don’t find were the leak comes from. I thought it could be a cooling or heating water, therefore I checked both heaters (roof and wall) today, and they are OK. The crew is out of ideas considering this leak (I also checked taps yesterday), therefore such a map can help me. The crew needs indications about trashes to know exactly in which ones burnable and unburnable wastes have to be put into. All engineering checks were nominals, but during the EVA both fans turned out of service. Also, the necklace which holds the helmet was not stretched enough so that the helmet fell on the neck of Gabriel during half of the EVA. Backpack 3 joined backpack 4 to the list of backpacks the crew need to fix. We’ll certainly begin to fix them tomorrow. Only 15 Mo were left this morning (immediately after the very connection of the day were established). Yet, the leak is unknow. I reported the problem this morning and the crew have communicated with CapCom to find a solution. I had to go out of the SIM to turn on the generator at 6:20 PM. Solar SOC was at 53%, I hope batteries are not injured. Generator (hours run): Turned of at 12:00 and turned on at 6:20PM. -Backpack 3 is put aside. Starting fixing backpack 3 and 4 tomorrow. -Two thermometers and the shape for the GreenHab received in the airlock. Jeremy (GreenHab officer) will set it up tomorrow. -The pipe in the low desk seems not to flow anymore. All water devices in the Hab and GreenHab were tested one by one and none trigger the leak. -Considering a Dr Rupert’s request, a mattress will be put in the airlock between 8PM and 9 PM. Narrative: Today, the greenhab had many visitors. We installed the new shades (80% shading) and it was a hassle, it took us a lot of time and was very complicated! Almost all the crew participated in this installation. The commanders and the astronomer helped a lot and without them I would not have been able to do it! Thanks to this installation I noticed that many tomatoes plants were bending and with Benoit we used many wooden sticks. We changed the organisation of the GreenHab quite a lot. I still have many work to do to rearrange all this but, at least, the new cover is partially installed! We started by getting a lot of gear out of the engineering airlock: wastes, LOAC and tools. We then struggled to start the ATVs because of the coldness. When arrived on site, I had fog on my helmet because of the walk carrying the device, so that I didn’t see exactly chat happened, but while plugging the power wire, the power system overheated, and wires melted. I then disconnected the battery, but it was already too late. We evaluated then that only the power system was touched and apparently were right to guess so. Anyway, we packed everything back and went back to the hab to bring the sensor back. At the same time Benoit had checked the MegaARES and everything was fine there. After letting the broken LOAC in the engineering airlock, we headed to Cactus Road. 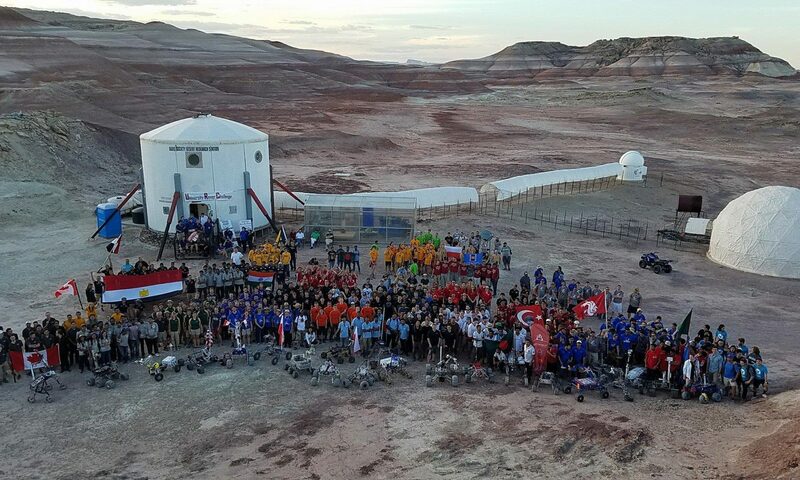 We then climbed a hill, went to an entrance of Candor Chasma and shoot some group photos with our school’s banner. The fog intensified for the ones wearing the first version of the suits, and it was pretty cold, so that we headed back to the Hab early. Normal start: everybody is now accustomed to the physical training even if some legs are already heavy. The third EVA was supposed to deploy the LOAC but it didn’t go that well. The power system had an issue and wires melted once I pluged it in. We then brought the equipement back to the hab, and went on for the EVA, going East to do a bit of exploration near Cactus Road, and shoot photos for the school. This afternoon was dense: after lunch break, we answered to a French journalist interview, played the first session of Gabriel’s human factor experiment, installed a new shade on the GreenHab, worked on experiments, so that we didn’t have enough time to fix the backpack’s fans. Tomorrow EVA will then be done using the new version, before we take time to take care of these (this time, I really want to do it tomorrow). Look Ahead Plan: Third deployment try of LOAC, data gathering of MegaARES, exploration of Candor Chasma, backpack’s fans inspection, end of shade replacement in greenhab. Anomalies in work: Broken light in the bathroom (no replacement one found). Water leak in the Hab Lower deck, broken fans in spacesuits. Crew Physical Status: Fine, already a bit tired, but everybody naped.